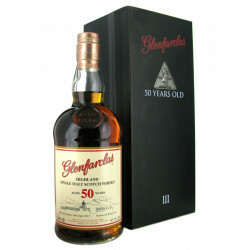 Glenfarclas 50 Years-Old is part the legendary Family Cask range, it's an exeptionnal 1960 whisky collector, matured in sheery casks. Glenfarclas 50 Years-Old is part the legendary Family Cask range, it's an exeptionnal 1960 whisky collector, matured in sheery casks. This Single Malt salutes the third generation of the Grant of Glenfarclas, they've created the J.& G family business in the 19th century. This limited edition has 937 bottles that has aged in old sherry oloroso barrels from the 60s. To preserve these precious aromas, it is unchilfilltered and bottled at 41.1%. This whisky for its age offers an unsuspected freshness. Warm, spicy, it builts chocolate ice cream aromas, caramel and candied fruit typical of sherry casks. Its elegance moves on deep smoothness, symbol of its great age, a never ending feeling on the palate. Nose: an unsuspected freshness for a whisky of this age. A pleasant range of flavours (spices), letting then elegant caramel notes, chocolat ice cream, candied fruit, typical of the sherry barrels. Palate: silky and suave, a perfect balance between sherry aromas, cinnamon, and spicy fruits, reinforced by a fantastic smoothness coating the palate. Finish: the constant fruity sweetness claims brilliantly Glenfarclas's style.